Its summers and all i want to eat is salads (bowls full) as nothing makes you feel as light and fresh as they do. I love mangoes and so its an obvious choice that i am using mango in everything possible. I feel not only do they add colour and vibrancy, they are so juicy and so full of flavour and sweetness that its just amazing and rightly so as they are the king of fruits. Fresh, juicy, yummy, healthy what more can one ask for in a salad with a grown-up edge of ginger and chilli. 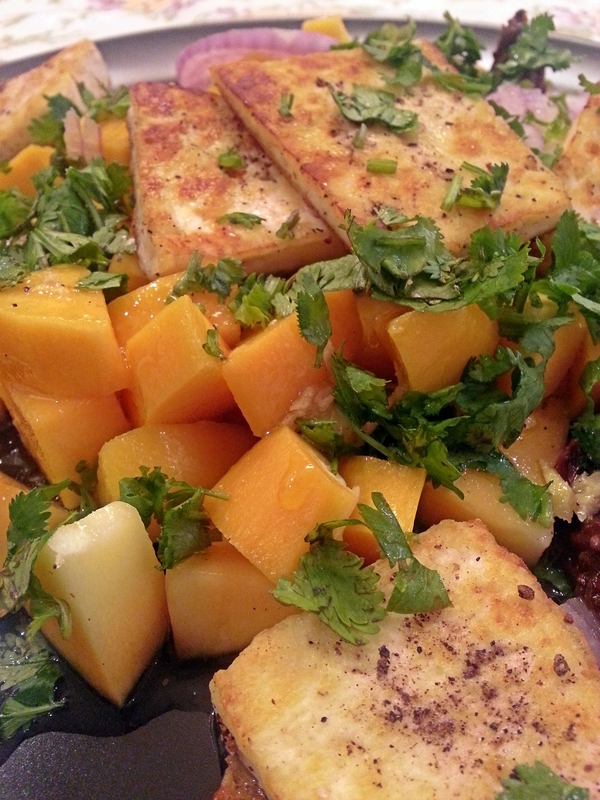 I loved it and i really want you to enjoy it so please do use a good, ripe mango and fresh paneer. Put the grill on. In a small bowl whisk together the ingredients for the dressing and set aside. Make sure the sugar and salt have dissolved completely. Toss your paneer in a little olive oil and season with salt and pepper, place on an oiled rack and grill until it has browned around 7-8 minutes. You can also griddle the paneer in a hot griddle pan. Meanwhile toss the remaining salad ingredients with the dressing and when the paneer is done, place on top, serve immediately. Add 4 large handfuls of baby spinach or mixed salad leaves for more yumminess and crunch. ( I could not use any as i was out of it but yes it completes the salad and makes it a complete meal with just toast on the side). Looks like a great salad and the photos are so nice! Looks lovely and fresh. Yum. 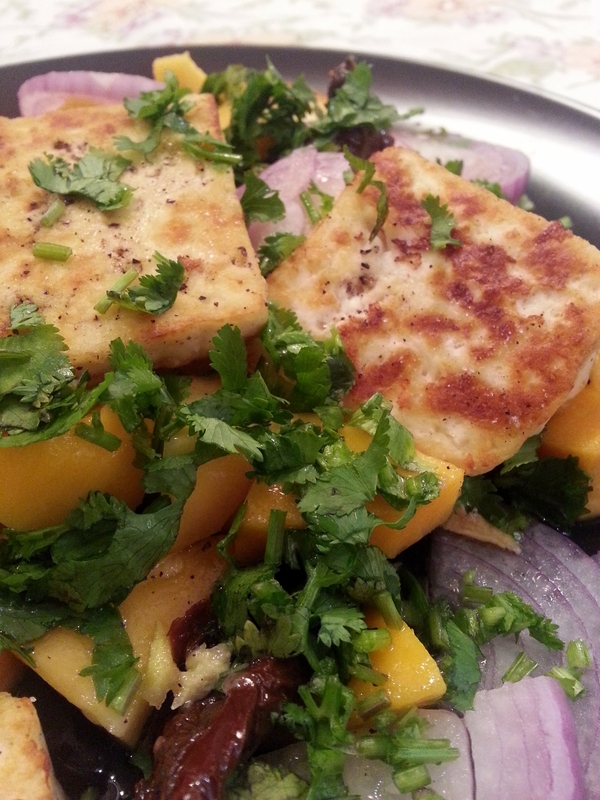 I have never tried it grilled and your paneer looks firm and perfect!